With the busyness of the holidays behind us, the new year can be a time of rest or a time of fresh beginnings with ambitious resolutions. As the month wears on, with gray days and cold temperatures, it can also be a time of dreariness. As the frigid weather in some areas hinders regular outdoor playtime, cooped up children become agitated with schoolwork and family members. Agitated children lead to irritable moms. Irritability can turn into discouragement. Then it hits: the winter homeschool blues. Instead of succumbing to what some think is inevitable, I suggest you make a change this year that may prevent the blues from even rolling into your homeschool or, at the very least, lessen their severity when they do come. The key is to be proactive in your approach. Moms are often skilled at being proactive. We bring snacks and drinks with us for our family when we go places. Sometimes we carry books or games for impromptu diversions. We’ve memorized countless games to play that require absolutely no supplies other than our imaginations that we can pull out the moment they’re needed to keep our family occupied or to avoid a tantrum. We know that kids get thirsty, hungry, and bored and we’ve figured out how to prepare for those situations. 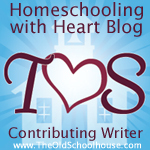 Why don’t we prepare our homeschools for the winter blues? To prepare for, and hopefully prevent, the winter blues requires some creative thinking. You can either do this together with your children or do it on your own and let your children be surprised. What you’re going to do is to come up with an arsenal of ideas that will help keep those blues away. You can create a master list to choose from, but I think it will work better if each idea is on a separate piece of paper tucked inside of a special container. The spontaneity of choosing those papers will add to the fun and that is the whole point. The fun will help to keep the blues away. The ideas that you come up with do not have to be complicated or require lots of preparation and supplies. The best ones are often the simplest. Here are some ideas: Draw a super silly face and try to imitate it. Listen to an upbeat song and dance around the room. Play hide and seek. To put this into practice, you can either make choosing a paper a regular part of your day or make it completely random. You may just want to pull out your arsenal when it’s needed. If there’s a day that you wake up and just don’t want to teach, pull out an idea. Begin your day with that instead of your normal routine and see if you feel better. Or, if there’s a day when school is just not going as planned or the kids are especially cranky, take a deep breathe, pull out an idea, and move forward with it. The point is to stop the blues before they fully come. Be aware of how you’re feeling each day and how your children are behaving. If you sense that something is amiss, stop what you’re doing for some preventative maintenance. Pull out an idea and have some fun. The time you take now will save hours later and you will feel so much better. Your family will feel better, too. Enjoy this winter knowing that you’ve got a plan in place to fight those winter blues.